ProClean™ built-under dishwasher is rated 4.2 out of 5 by 11. 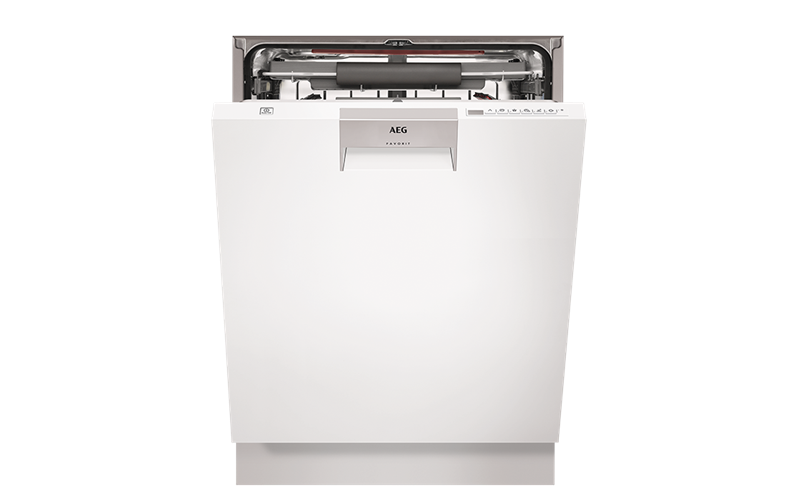 60cm white built-under dishwasher with 7 programs, ProZone, extra tall XXL tub and ProClean™ satellite spray arm to deliver a perfect wash result, regardless of your load. The ProClean™ powerful, double rotating satellite spray arm, with 5 spray levels, ensures maximum water coverage over your entire load for a perfect wash result. Ideal for washing mixed loads in one go where you can load the lower basket with heavily soiled pots and pans, and place delicate glassware in the top basket. This advanced function uses multiple sensors to measure the size and soil level of dishes and gives the best possible wash performance ensuring efficient time, water and electricity consumption. With an XXL tall tub, youll find an extra 4cm of internal height to load larger and unconventional shaped items. Rated 5 out of 5 by Wends from AEG Dishwasher great I brought this and waited 3.5 weeks delivery. Install was done with delivery which was great, took about 40 mins. Love the separate utensils rack, adjustable height in mid rack. I love the 30 min quick wash. Nearly 2 weeks old and it’s a great washer so far. 5 stars from us. Rated 4 out of 5 by Wendy Woo from Impressed This machine does actually take more dishes etc than my old dishwasher and is very quiet. I am impressed with the bottom tray with its ability to fold down some prongs for larger items e.g. saucepans and bowls. I like the cutlery tray but it did take a bit of getting used to where to place the knives, forks, spoons as my handles are largish. But it replaced my old under bench dishwasher which was flush with my kitchen cupboards and now the kick board of the AEG goes back 11cm exposing old floor boards. The programs are longer than my previous one but then I found the button to reduce the cycle by 50% which I now use. Other reviewers say AEG installed the dishwasher free of charge whereas I had to pay an installer. Maybe this is due to being in a different State of Australia, but I do wonder. Rated 4 out of 5 by Anjelika from Great design I bought this product a month ago. Iris very quiet, cleans very well. Inside the dishwasher deign that all sorts of dishes can be store. Wine glasses has a special rubber holders so no more breaking glass. I’m very happy with the product it’s worst to pay an extra . Rated 4 out of 5 by Kez2 from Fantastic Clean and super quiet I bought the dishwasher about a month ago, very happy cleans great and if not for the red light wouldn't know its on. So quiet. Only issue is stacking the cutlery. Rated 5 out of 5 by Terry Brogan from Unbeatable offer! 5 year warranty and free installation and removal of old machine. That's unbeatable!. The inside layout is superb and the cutlery tray is much more practicale. Love it! Rated 3 out of 5 by Stuey from Features worth comment Knife draw challenging to pack and unload, wine glass stem holders - useless, hoping the quality has been concentrated in the general electrics, mechanism and pumps. Rated 5 out of 5 by Stav from Great sleek design, seamlessly fits into kitchen This is the second AEG dishwasher bought in last 12 months due to selling previous house. ( 5 year warranty and free installation and removal of old machine, how can you beat that!). Also the installers John and Linda were a credit to AEG. Love the red light beaming on floor highlighting machine is on and the cutlery tray is so more useable than a cutlery basket.